Q: What quality are your cedar trees? A: We sell only high-quality cedar trees. We select the best bushy trees that have no signs of burning or chafing. Q: What size of cedar trees should I get? A: Taller trees will provide you with more privacy but will cost you more money. We provide cedar trees in various sizes. Q: What size trees should I get for instant privacy? A: 11-15 foot trees will give you instant privacy. Smaller sizes will take time to give you this result. Q: What distance apart will you plant the cedar trees and how do I know how many I will need? A: We generally plant two trees per foot for 3-4 and 5-6 foot trees and one for every 3/4 foot for 7-8 foot trees. Trees larger than 9 feet, one tree is required per every one and a half feet. This will allow the roots to establish and gain strength while growing into each other. Measure the linear distance in feet of the area you want hedged. 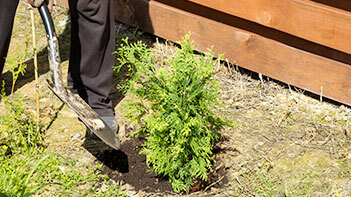 Q: When is the ideal time to plant cedar trees? A: Ideal times are when the ground is wet and moist but it is okay to plant them anytime when there is no frost. As long as the after-care instructions are followed as far as watering after transplanting, the trees will grow healthy and strong. Q: Do you dig by hand or with specialized equipment and how deep do you dig? A: We dig a trench by hand which is about 1′-2’ wide and about one foot deep depending on the size of the root ball of the cedar tree being planted. Q: How far should the cedar hedge be planted away from fences and sidewalks? A: We plant cedar hedges about 6 inches away from fences which allows the trees to grow without any obstruction for a few years. Q: What if we don’t have a fence in the location where you are to plant the cedars? A: We often plant cedars in areas without fences. 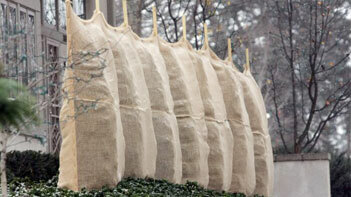 We ensure that they are planted in an upright position and secured properly. It is recommended to use metal stakes for added support in trees larger in height than 11 feet. Q: How long does it take to plant the cedar trees? A: There are so many variables as to the length of time it will take, such as weather conditions, accessibility of the area to be hedged, distance from our trucks, soil type, size of trees, etc. Generally, jobs take about 2-5 hours. Heavy rain makes it very difficult to uproot and plant the trees therefore scheduling may be necessary. Q: Can I plant them myself? A: It is your choice whether you want them delivered and planted, delivered only, or you would like to pick them up. An after-care instruction sheet will be provided in all cases. Q: How tall will cedar trees grow? A: Cedars will grow up to 40 feet tall in optimal conditions. Q: How much will a cedar hedge grow each year? A: They will grow about one foot per year as long as you water them through warmer months and fertilize them annually. Q: How long will it take for the cedar trees to become a full privacy hedge? A: This depends on the height of tree we are planting. Trees taller than 11 feet will provide instant privacy. 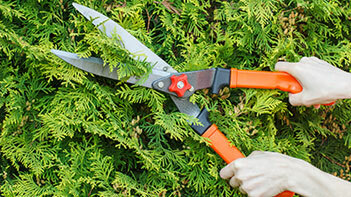 It is very important to trim the tops to encourage fresh growth. Your service was great. The customer service was great right from inquiring about placing an order, actually placing the order and the delivery and planting of my healthy cedar trees. The guys worked so hard in planting them. I appreciate your excellent work. I placed an order from the website and had my cedar trees delivered and planted the very next day! Your prices are astounding. Checked other nurseries around and they didn’t even come close to yours. The tips on the website are very helpful and the video is exceptional. Thank you very much for the great job you did on my hedge! I got the instant privacy that I was looking for. Got rid of that nosy neighbour. Thank you guys! Great prices and great service. Would recommend this service to anybody. Why go anywhere else? Thanks Sandy and the guys!